When you create a video, there is ample deliberation pertaining to the visual content, the target audience, the message, the theme, etc. Thus, in a way Video Marketing serves as an endorsement of the basic theme and concept behind your product or your services. The advantage of Video Marketing is that you have various platforms to showcase your video content. There are a number of video sharing websites that allows you to post product and service promotion videos. Besides, you can also post your video on your website. 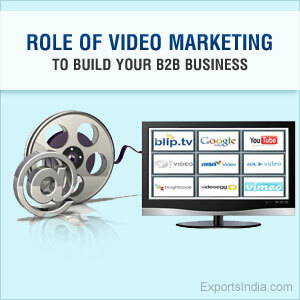 Thus video marketing is a source of tremendous exposure for your B2B Business. You can swap your videos with other sites ending with more visits to your video and eventually website. You can raise the tally of your email marketing list by simultaneous marketing of video and your product. You can post a link to your products or website along with the video and see the result. The role of Video Marketing is increasing in B2B Business and you must be aware of strategies and techniques to stay in the fray. The videos should be tagged with suitable keywords for Search Engine Optimization. This is the best way to draw maximum traffic and attention to your B2B Business. Remember, Videos describe and demonstrate simultaneously, they can be shared virally, take no time in delivering the message, create awareness, hence Video Marketing is one of the most effective alternatives of conventional advertising. 4 thoughts on "Role of Video Marketing To Build Your B2B Business"
Hello, its pleasant post on the topic of media print, we all know media is a wonderful source of facts. Hey there! I simply want to give you a big thumbs up for your excellent information you have got right here on this post. I will be returning to your site for more information soon. I discovered your weblog site on google and examine a couple of of your early posts. Continue to keep up the superb operate.